Here I'm mostly going to focus on professional achievements. This year has had a lot of change personally too, but I'm not so interested in telling the internet about that. Here's the short list, and then details in sections below. Launched multiple software packages on NuGet & NPM. I became a Microsoft MVP in 2018, and that's been brilliant. I've already met a lot of people because of that, and this upcoming year will be even more exciting because of that. I started the Knoxville Microsoft Azure Meetup in 2018 and I hope to grow it tremendously this upcoming year. Lot of amazing stuff going on in the cloud. I'm doing better at blogging things as I learn things, or as I investigate something new. Most of my blog topics are just something neat I found, and not something I'm using at work. I published 32 blog posts this year. Google analytics is not my strong point of understanding. I set it up, turned on what anonymization flags I could find, and hoped it was setup properly. I haven't taken the time to really make this right. I don't care so much about exact numbers as much as just guidelines telling me the relative performance of each topic. Knox Tech Trend: A website for analytics of Knoxville, TN Technology Trends by aggregating Knoxville tech Meetup data. MSSQL Exporter for Prometheus, with support for custom queries to generate custom metrics. 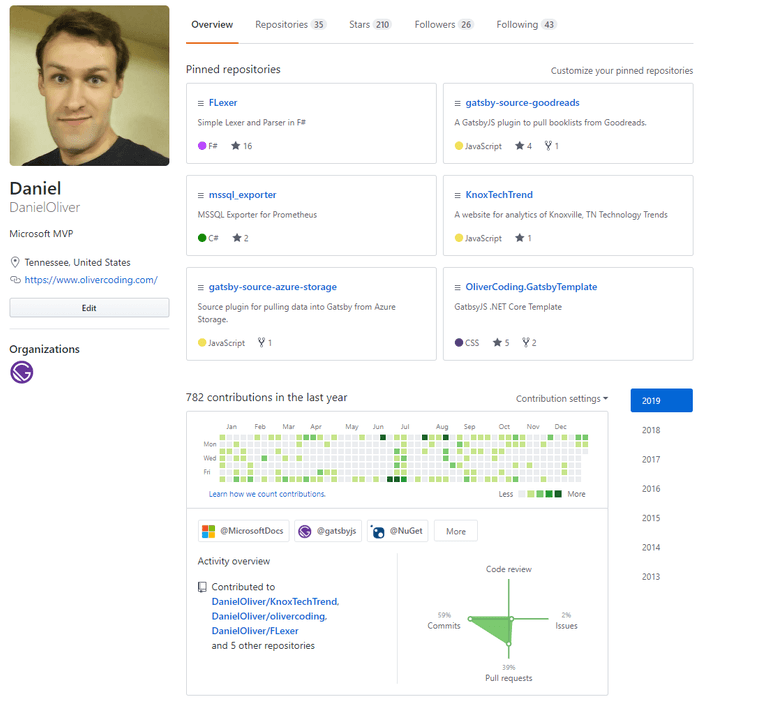 My GitHub profile is definitely greatly increased since 2017. There are certainly gaps in there, but I've been working on stuff as I can. A few gaps in there represent working on closed source items on other platforms or personal time, and that's okay. The complete listing of talk abstracts and locations is here. I've given 4 talks, a total of 9 times, at a total of 6 venues. Azure. A lot of Azure, both personally and professionally. It's a spot that's just really enjoyable for me. C# & .NET. Nothing surprising about this, it's my comfort food of programming languages and libraries. F#. I have a lot of personal projects in F# and I really like how it makes my mind change to think about it. Oracle database & Oracle E-Business-Suite. I assure you, I was just as surprised as you might be. Salesforce. An interesting platform that just works. Talend. I'm actually certified in this. Java. This goes hand in hand with Talend and Oracle. Ansible. This tool for server configuration and provisioning is a great default for me. I even gave talks about it at conferences. GatsbyJS & ReactJS. I've published a few libraries for GatsbyJS, and somehow got on the GatsbyJS maintainer's organization. I presume it's their mistake. What I did above doesn't show how I got there or what I'm doing to go further. The short version of that, is that I have good friends and good work colleagues and good books. 2019 is going to be an awesome year!! !